Frack Wastewater – Let’s Dump It On The Roads! According to The Ithaca Journal, several municipalities in New York have approved the use of fracking waste water in road maintenance. The flowback water from fracking contains salt, and is being called a “natural brine” to be used for winter snow and ice clearing, and dust management. However, this flowback waste fluid also contains toxic chemicals, heavy metals and radioactive materials. Toxics Targeting, an environmental monitoring firm in Ithaca, has released documents showing the permits for, and the rationalizing of, this dangerous process. You can take a look at the original documents released by Toxic Targeting and an interactive map of the areas to be affected on their website. A.D. Call & Sons Excavating, of Stafford, N.Y., submitted a beneficial use determination application to the DEC for production brines from gas wells in Medina, Theresa and Queenston wells in February and March 2010. The DEC approved the request, with certain conditions, in April of the same year. Isn’t this an admission that the brine run-off is NOT safe? Does anyone actually believe that this water won’t find its way into New York’s waterways, including drinking water systems? Walter Hang, president of Toxics Targeting, relays the message that use of this water has not undergone any health risk assessment and is likely to be very unsafe. It is not hard to imagine this wastewater flowing into aquifers and having serious health and environmental implications. Who comes up with these ideas? 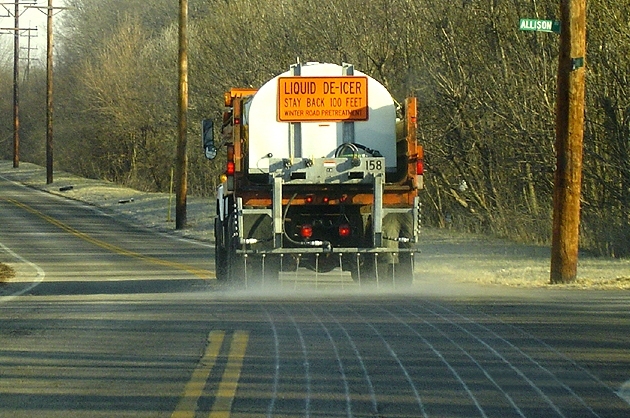 Is the brine we spray on the roads in PA a product of Fracking? Does it include the toxic chemicals in flow back water? If it is I would definitely like to see some evidence of this practice. Its not just the rivers and streams that we should be concerned about, we should also be looking into the possibility of what happens when this frack waste water works its way into the watertable and thru capillary action effects the surrounding farm land and thus inhibiting the production of healthy food. There is alot to be considered here, but be that as it may this should not be allowed to proceed. my thoughts exactly, Patrick. what about organic farmers, whether commercial or residential? soooo….the main question is, what can we do about it? do we contact our townships? or is this controlled by something much bigger than local municipality? ALL the water on my neighborhood’s streets flows directly into the nearby creek which is already contaminated by decades of continuing, acid mine waste. Who ever thought of water fracking is an idiot I’m ashamed of this greedy person obviously money was all they thought of WHERE IS THE PETITION?????? So either give up winter driving and stay home, or go with lesser of the evils. Hi Hal, you seem to not be clear about how salty fracking wastewater (flowback) is. Fracking flowback is generally 3 to 6 times saltier than ocean water. That is very, very salty — that’s why it’s used for de-icing. So flowback is much worse, not a lesser evil at all. It creates all the problems salt creates (turning our freshwater salty, damaging roads, harming aquatic life) and is full of the original fracking chemicals (endocrine disruptors, biocides, carcinogens and all) PLUS the toxic substances that occur in the deep rock, including radium 226, which causes bone, liver, and breast cancer as well as other damage to health. Obviously we do need to move to a society less dependent on cars, as you suggest. In the meantime, no fracking flowback on our roads! Even if it were sprayed in amounts that they argued wouldn’t wash off the road much before evaporating, all that would mean is ever increasing concentrations of toxic metals waiting for the next snow storm or rain. Those heavy metals would then runs off into streams, ponds, filter down through the soil, and make it your drinking water and food. If I lived out there I would be writing letters to officials and getting petitions together to stop it! This is link to the Harvard Law Center concerns on PA beneficial reuse of Marcellus wastewater. Very important it this is the attachments as well as the 30 some pages of concerns never addressed by PADEP. These attachments show high radioactive levels (over 10,000 picocuries per liter) of alpha, beta, and high radium 226, and radium 228. These attachments also show where this water was used on roads in PA. And there is a letter from NY on approval to dispose of drilling water. Again this is more like normal background in low picocuries per liter VERSUS the high wastewater samples in first paragraph. The radiation in drinking water ranges from data collected from the period 1978 to 2012 and the location average would be Pennsylvania, and the overall (multi-state) average includes Pennsylvania. The Gross Alpha consisted of 159 samples. The location average was 0.256 picocurie/liter with a range of below detection (0) to 8 picocuries/liter. The multi-state overall average was 1.42 picocurie/liter. The Gross Beta consisted of 160 samples. The location average was 2.34 picocuries/liter with a range of below detection (0) to 6.35 picocuries/liter. The multi-state overall average was 3.09 picocurie/liter. Note that in the above EPA monitoring the concentrations are well below the 10,000 plus picocuries/liter concentration. The Radium-226 consisted of 86 samples. The location average was 0.00922 picocurie/liter with a range of 0.07 to 0.2 picocuries/liter. The multi-state overall average was 0.356 picocurie/liter. The Radium-228 consisted of 120 samples. The location average was 0.00258 picocurie/liter with a range of non detect to one sample of 0.31 picocuries/liter. The multi-state overall average was 0.0688 picocurie/liter. Note that the above EPA Radium 226 and Radium 228 concentrations are well below 892 and 2,589 picocuries/liter in the wastewater samples noted below. Now PADEP is doing a radiation survey of Marcellus cuttings, wastewater, and other media. A great idea but some concerns I had asked Harrisburg DEP over a year ago might still be of concern. However, one question that could have been easily answered but was not was in an email to PADEP dated February 20, 2011. This email (attached to this email) was mainly on the Hazleton reclamation site but also had concerns on drill cuttings proposed for unlined reclamation sites and lined landfills.This was one of the concerns from this email that the PADEP Office of Chief Counsel would not allow to address due to (unrelated) litigation. The main point is that landfill radiation monitors are typically well above the incoming trucks and not sure but believe this is for gamma radiation. Yet, to measure alpha or beta radiation you would need to have detectors almost on top of the waste to do this correctly. Alpha and beta can easily be blocked even by normal clothes BUT breathing in dust with radioactive elements emitting this type of radiation can possibly be a serious health hazard. Feel free to comment on any misconceptions that I have on landfill radiation monitors but believe this was a serious question never responded to by PADEP approaching two years. I believe if you look at the attached email there are no unreasonable questions. Are the typical landfill radiation detectors installed at landfills adequate for alpha and beta radiation? I am no expert on landfill monitors but do recall that you need to almost be on top of alpha and beta radiation sources to detect problems. Also it seems that radioactive emitters do not necessarily always have proportional alpha, beta, and GAMMA radiation. Seems to be a question that would not require years to answer. Another factor that is important is that cuttings are typically saturated with the Marcellus water. The liquid is typically absorbed with addition of sawdust or alkalne waste materials. The point of this statement is that the high documented concentrations in water would also be on this added material. Another concern is using abandoned mine water (acid mine drainage) for water supply in drilling and fracking leads to other questions also submitted to Harrisburg. The PADEP appears to be encouraging the use of mine water from abandoned mine areas in Pennsylvania. Another possible good use of non potable water but again serious concerns should be considered regarding storage in unlined pits and impoundments and unknown reactions when mixed with the lower formations (Marcellus and others) that are of marine nature. It would seem that anticipated leakage into used upper aquifers from storage in unlined facilities will happen from past experience rather than just a theoretical possibility. Typically these mine waters have low pH, sulphates, iron, manganese but may also contain toxic metals (selenium, mercury, arsenic, cadmium, chromium, and other metals not proposed to be tested for it would appear. The options allow unlined pit and impoundment storage. This would seem to provide a very possible potential for leakage into the upper used aquifers as well as unknown effects of mixing with the Marcellus relatively high background radiation, volatile organics, semi-volatile organics, metals, salts, and gases. Note that there may be mine water considered from former landfill or cleanup projects that could easily add additional contaminants. The proposed sampling in the PADEP White Paper states the proposed samples. However, many of the toxic parameters of the commonly tested USEPA Target Compound List (TAL) are omitted from this sampling. The last source is a good four part article on Marcellus that goes into the alleged health effects for a truck driver, and more on normal radiation. Please help with a petition I made recently at http://signon.org/sign/stop-using-toxic-fracking. I hope to deliver it to Cuomo, NY Assembly and Senate on 2/26. More signatures will help get this closer to a bill, please help get the word out! The petition asks that fracking brine use stop and that the public be notified when and where it is in use. Thanks for all you do.